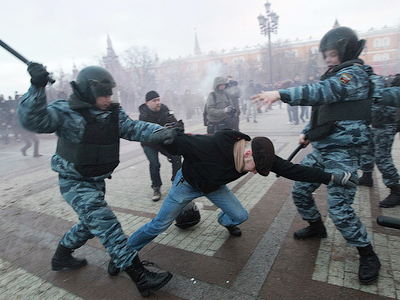 Moscow police have prevented a nationalist rally on Moscow’s central Manege Square, which was due to start on Tuesday evening, exactly a month after the place became the scene of violent clashes. ­The failed gathering was masterminded by a nationalist calling themselves “Movement of December 11th”, previously unheard of. The rally was scheduled for 7pm Moscow time, but police cordoned off access to the square and closed the nearest Metro station. Around 2,000 policemen were mobilized to maintain security. According to the Interior Ministry, police detained about ten people, who were released shortly thereafter. 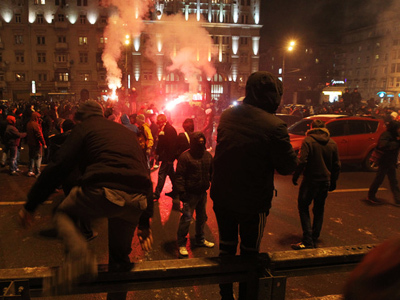 Media reports suggest between 50 and 100 were detained, including two journalists. They were released after verification of valid documents. According to Kommersant daily, police paid special attention to natives of the Caucasus and to people dressed in sports jackets. A man in a Father Frost costume also came under suspicion, so police asked him to show his ID as well, the paper writes on Wednesday. 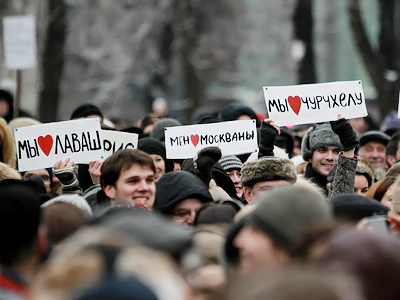 The Movement of December 11th was formed following a brawl on Manege Square last month. What was supposed to have been a peaceful rally in commemoration of a killed football fan turned violent, instigated by nationalist slogans. More than a hundred people were detained. The members of the new movement demand Moscow be “cleansed” of immigrants from the Caucasus and that immigration legislation be tightened.